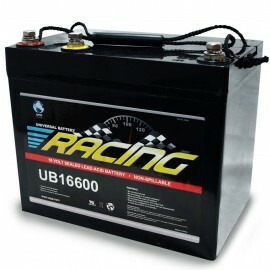 Our featured Racing Battery UB16600 by Universal Power Group is a 3 terminal dual-output design. A powerful 16 volt or it can also operate at 12 volt allows you to use 16v for starter-ignition and 12v for everything else. It is 60 ah with 1500a pulse-hot cranking amps. This Maintenance-Free Sealed AGM racing battery can be mounted in any position and is your solution for circle track racing, as well as drag racing. Wholesale Batteries Direct has the high quality batteries that you want to buy at discount prices. All of our batteries come with a full 1 year warranty.